The Timer artwork from Ultimate. "Clock" redirects here. For for the smasher, see Smasher:Clock. "Timer" redirects here. For for other uses, see Time (disambiguation). The Timer (タイマー, Timer) is an item in Super Smash Bros. Brawl, Super Smash Bros. 4, and Super Smash Bros. Ultimate. It was previously referred to as the Clock before the Item Encyclopedia update. The editor who added this tag elaborates: Requires further research into other games. Artwork of the clock from The Legend of Zelda. While the design of the Timer is original to Smash, several items similar to the Timer have appeared in games represented within Brawl and Smash 4. The Clock item featured in The Legend of Zelda would freeze all enemies onscreen until the user left the screen. A similar item, the Stop Watch, later appeared in Super Mario Bros. 2, with the item's effect on enemies only lasting for a short amount of time. 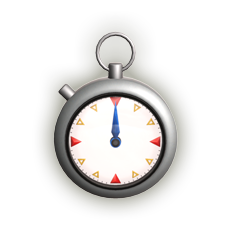 A Timer in Super Smash Bros. for Wii U. When the Timer is grabbed, all characters except for the character who grabbed it will be slowed down to 1/4 of their normal speed, regardless of the gameplay speed (and therefore the item has no effect if the game is set to 1/4 speed). This presents a significant buff for any character to not be slowed down — slowed characters will have a difficult time landing hits and become far easier to hit, even with charged smashes. However, the timer occasionally backfires, causing either only the player who grabbed the Timer to slow down, or each and every character to slow down; in the latter case, a player being KOed during that time will end the Timer's effects immediately. As with the Smash Ball, Lightning Bolt, and Dragoon Parts, computer players will try to grab this item as soon as possible. Shadow uses Chaos Control to much the same effect, except that he never backfires and the effect lasts regardless of if the opponent gets KO'd in that time. This item will slow down all animations, however, knockback and hitstun are not slowed down (although the hitstun animation still is), and since falling speed is reduced to 1/4 speed and knockback is not, the game will treat the launched fighter as if they were launched at full speed, but if their fall speed were much lower, weakening vertical survivability. Invincibility frames and counter frames are very long for the characters who are victims of the Timer, which gives them a very easy way to wait for the timer to stop and being hit less by the characters who are not slowed down. In addition, most projectiles are not affected either. Interestingly, the slowdown seems to act more like a status effect, and any characters that are KO'd while slow will respawn at normal speed, even if the stopwatch "effect" is still on screen. That said, the effect will go away if all affected characters get KO'd. The Timer has a much more rounded design, compared to the dodecagon design of Brawl, due to the graphical upgrades of the games. Also, unlike Brawl, knockback and hitstun are also slowed down. The timer's effect also now considers the gameplay speed, and so a fighter affected by the Timer while the game is set to 1/4 speed will be slowed to 1/16 speed. Finally, a swirling graphical effect is now applied to any fighters affected by the Timer. The timer appears again with little gameplay changes from Smash 4. When used, it causes a unique background until the effect ends. The Timer trophy in Brawl. An item that slows down time and your enemies' movements. Only the player who gets the item will move at normal speed. You should enjoy a huge advantage in both attacking enemies and snagging items that appear. If an enemy manages to get to a powerful item first, you'll be able to shield and dodge and keep any damage you take to a minimum. The Timer trophy in for Wii U. The Timer trophy in for 3DS. Pick this up to make time move slowly for everyone but you! With the timer in hand, grabbing items and attacking gets much easier, so if someone else gets it, start defending yourself. Timers can be a little hit or miss, though. It might slow time down for everyone, or maybe just for you! Artwork of a Timer from Brawl. As the Timer greatly increases hitlag for the afflicted character(s), and moves with electric effects multiply hitlag for the target even further, it is possible to use attacks such as Zelda's Lightning Kick and Captain Falcon's Knee Smash repeatedly on the opponent before they are even able to move from the knockback of the first attack. Examples of this on YouTube can be found here and here. Most, but not all, Final Smashes will nullify the effect of a Timer. A glitch occurs when a timer is grabbed during the invincibility frames (after the throw but before the catch) of Ike's Aether. His sword will appear to spin around his head while he is still on the ground. When an enemy is under the effect of Timer, and another player does Footstool jump, Falcon Dive or Dark Dive, the player's character's animation will be slowed upon the move. In Smash 4, if one uses a Timer in Training Mode and proceeds to KO the CPU by using Flame Choke in midair, the effects given to the opponent (i.e., jumping, landing, electricity) are slowed down. This page was last edited on March 20, 2019, at 14:20.